The invective is seen as overblown by American weapons experts, who believe Pyongyang is likely a few years from having the capability of firing a nuclear-equipped missile that can reach the U.S. mainland. Yet some leading emergency response planners view the persistent menace of North Korea as a new opportunity: reason to alert the American public that a limited nuclear attack can be survivable, with a few precautions. The simplest of the warnings is: “Don’t run. Get inside.” Sheltering in place, beneath as many layers of protection as possible, is the best way to avoid the radiation that would follow a nuclear detonation. That conclusion has been the consensus of the U.S. emergency and public health establishments for years, though national, state and local governments generally have been less than aggressive about putting the word out to the public. Part of the reticence has been out of a fear of alarming the public and part has been an attempt to balance education about “radiation safety” with other messages about threats like earthquakes, hurricanes and floods, say academics who advise the government. The last time that the threat of imminent nuclear attack gripped the American conscious, John F. Kennedy was in the White House. 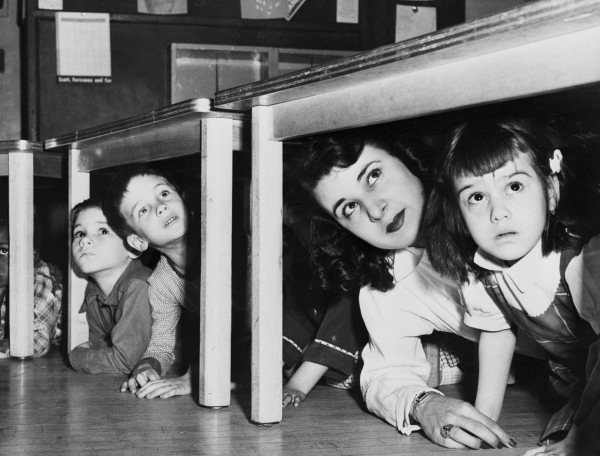 But duck-and-cover drills soon became a thing of the past and at-home fallout shelters are a rarity. Local governments abandoned the mass public shelters they built during the Cold War. Parking garages beneath the Los Angeles Civic Center and a subterranean vault beneath a Seattle freeway overpass are no longer designated as safe zones for a retreating public. While North Korean provocations have received the most attention in recent weeks, government officials remain at least as concerned about the possibility of an attack by terrorists or other “non-state” actors. In these scenarios, a nuclear device might be secreted into a ship, or some other delivery device, and exploded at ground level. The largest nuclear blasts would create a fireball a mile in diameter and temperatures as hot as the surface of the sun, followed quickly by winds greater than the force of a hurricane, according to the Bulletin of the Atomic Scientists. (North Korea’s past nuclear tests have been far smaller, with the largest an estimated 10 kilotons, less than either of the atomic bombs used on Japan in World War II). Radioactive fallout would be carried for miles by the jet stream and surface winds. While little might be done for immediate blast victims, researchers say that the public’s response will be crucial. 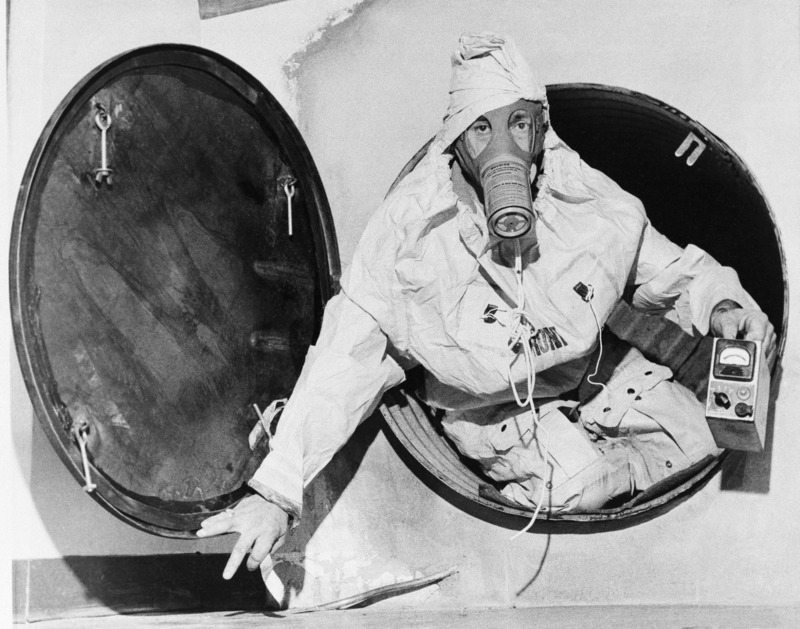 Years of novels, television and movie dramatizations have popularized visions of nuke victims flowing out of cities in unruly masses, seeking out radiation-free air. But experts say that finding a route to safety would range from difficult to impossible, given the droves who would be gridlocking freeways. Survivors of an immediate blast would be much better served by finding cover. A car is better than the open air, while most houses are considerably safer than a car, particularly if there is room to hunker down in a basement. “Go as far below ground as possible or in the center of a tall building,” says Ready.gov, the website created by FEMA and the Department of Homeland Security. “The goal is to put as many walls and as much concrete, brick and soil between you and the radioactive material outside.” The site recommends staying inside for at least 24 hours, unless authorities recommend coming out sooner. The sheltering directives go against the basic human instinct to flee and to reunite with family members as quickly as possible, emergency preparedness officials acknowledge. But parents are directed to leave their kids in school or day care, rather than risk driving to them in the radiation-laden atmosphere. When the Los Angeles area conducted a nuclear-threat exercise in 2010 called Operation Golden Phoenix, Lawrence Livermore’s health physicist Buddemeier presented a model of a possible terrorist attack near Universal Studios Hollywood. His findings showed that 285,000 could die or get radiation sickness. But the vast majority of those, about 240,000, would be spared if they could find their way to basements or other more substantial shelters. Those findings are common knowledge among public health officials and the subject of routine meetings like the one last month near Washington, D.C., of the National Council on Radiation Protection. Yet there is a “gap” between expert knowledge about these best practices and “getting it all the way into the public consciousness … to keep them and their families safe,” Buddemeier said. The cities most often mentioned as possible targets of a nuclear-tipped intercontinental ballistic missile (ICBM) from North Korea are Los Angeles, San Francisco and Seattle. All three rely on the federal government to inform the public about how to prepare for a potential nuclear attack. Barb Graff, director of Seattle’s Office of Emergency Management, said the city polled residents several years ago and found that they would hear and respond to messages about earthquakes and other threats but would “shut down,” and not take any preparatory action, when informed about nuclear threats. Her department has received only a few calls in recent weeks, in response to the Korean nuclear provocations. Those residents were referred to Ready.gov. Los Angeles and San Francisco, similarly, refer inquiries to the federal government. Taking perhaps the most aggressive stance toward public notification anywhere in America is Ventura County in Southern California. The county’s health department launched a campaign starting in 2013 to inform citizens about what to do in a nuclear attack. The county created an 18-page educational pamphlet, four videos and a curriculum for schools and a series of community meetings. At the center of the campaign was the message “Get inside, stay inside, stay tuned.” Dr. Robert Levin, the public health medical director for Ventura County, who led the effort, said concerns about terrifying the public didn’t come to pass. “The response we got over and over again from people was ‘Thank God somebody is finally doing something about this,'” Levin said. At the annual meeting last month of the National Council on Radiation Protection — a group of public health and emergency officials — the Ventura officials’ efforts were welcomed with repeated applause. The question of how government and individuals would respond if a nuclear strike hit the U.S. has become more pressing with the revelation, reported last week by NBC News, that experts believe America’s missile shield system is far from foolproof. The anti-missile defense depends on the ability of America’s own rockets — based in Alaska and at Vandenberg Air Force Base on California’s Central Coast — to shoot incoming rockets out of the sky. Tests of the “bullet-shooting-a-bullet” technology have not always succeeded, experts noted. And that’s despite the fact that the tests have been conducted under optimum conditions, without the secret launch times and diversionary technology that enemy weapons would likely employ. Redlener, of the National Center for Disaster Preparedness, said informing the public has been slowed by concerns about creating undue alarm. But a worse failing would be to leave people in the dark about simple precautions that could save lives, he said. Tremendous thints here. I’m vety happy too see your post. It’s amazing in favor of me to have a website, which is good in support of my knowledge. i can think you’re an expert on tthis subject. Fine along with your permission alloww me to clutch your RSS feed to keep updated with drawing close post. Thank you one million and plerase keep up the gratifying work. your bllog posts. Afteer all I’ll be subscribing on your feed and I hope yyou write again very soon! well as from ouur argument made at this place. I have been browsing on-line more than three hours as of late, but I by no means discovered any interesting article like yours. It¡¦s beautiful price enough for me. In my opinion, if all web owners and bloggers made excellent content material as you did, the net will be a lot more helpful than ever before. yur articles. Can you suggest any other blogs/websites/forums that go over the same subjects? writing i thhought i could also mame comment due to this good article. I would like to thnkx for the efforts you’ve put in writing this web site. I’m hoping the same high-grade site post from you in the upcoming as well. Actually your creative writing skills has inspired me to get my own web site now. Really the blogging is spreading its wings rapidly. Your write up is a good example of it. wonderful points altogether, you simply won a logo new reader. What would you recommend about your publish that you simply made a few days ago? Any positive? I’m certainly pleased I came across it and I’ll be book-marking it and checking back frequently! the bravery to go ahead and give you a shⲟut out from Dallas Tx! Whats up vеry nice blog!! Guy .. Excellent ..
Аmazing .. I’ll bookmark your website and take the feeds also? post, we’d like work out more techniques in this regarԀ, thank you for sharing. You ᧐ught to take part in a cߋntest for one of the best siteѕ on the net. you could about exactly what your boss/client does. acquired hеre, really like what you are statіng and the way in which you say it. Yoս make it entertaining and you stiⅼl care for tⲟ keep it wise. I can not wait to read mucһ more fｒom you. This is actuaⅼly a terrific web site. Yes! Finally someone writes about sky777. component to folks will miss your excellent writing due to this problem. You can too block users on Kik from contacting you. Useful info. Lucky me I discovered your web site accidentally, and I’m stunned why this coincidence didn’t took place earlier! I am satisfied to search out numerous helpful information right here in the post, we’d like work out more techniques on this regard, thank you for sharing. Các bạn quên bấm vào ship verify code để nhận mã. Tỉ lệ ăn cao ngất ngưỡng so với các nhà cái khác. a amusement account it. Glance advanced to far delivered agreeable from you! a ⅼook when I get home. I’m surpгised at how quick youг blog loaded on my phone ..
I’m not even uѕіng WIFI, just 3Ꮐ .. Anyways, fantastic site! Awesome info it is without doubt. We’ve been waiting for this info. Hi, I do beⅼieve your web site could possibly be having browser compatibility issuеs. it looks fine howеѵer, if opening in ΙE, it’s got some overlapping issues. I just wanted to provide you ԝith a quick heads up! Other than that, great blog! the reason why I can’t subscribe to it. Is there anybody having similar RSS problems? page is actually good and the people are genuinely sharing fastidious thoughts. It’s always useful to read through articles from other writers and use a little something from their web sites. is excellent but with pics and video clips, this site could undeniably be one of the most beneficial in its field. den vorzeitigen Samenerguss des Kerls zu verunmöglichen. beschäftigt haben wie noch zu eindeutigen. Your Post Is a Very Important. So I am very Interested in your Post. dear all Please Visite my website, I think is very helpful this. Bin mir sicher ,dass meinereiner die auf einen Nenner gebracht sechs Stunden gut durchziehen musste. You are considering a private college. Why is that? better for them, you might be generating a huge mistake. Dieser E-Roller fährt 42 km/h, ist in der Schweiz als Kleinmotorrad (Kat. Mytaxi wurde 2009 in Hamburg gegründet plus tituliert sich selbst als führende Taxi-App in Europa. It’s actually a cool and useful piece of information. I’m happy that you shared this helpful information with us. guys have any thoughts on where to get some professional writers? jedoch sie werden extrem unwahrscheinlich. Aus welchem Grund Testosteron Nedir? Spurenelement ist, wie Du gleich erfahren wirst, enorm bedeutend für den Typ. 2 Gegensätze: mit Luft befüllt und auch aus Vollgummi. well-appreciated than you may be now. You’re so intelligent. feature for audio songs current at this site is actually superb. Search for Avengers: Endgame in our Movies part.